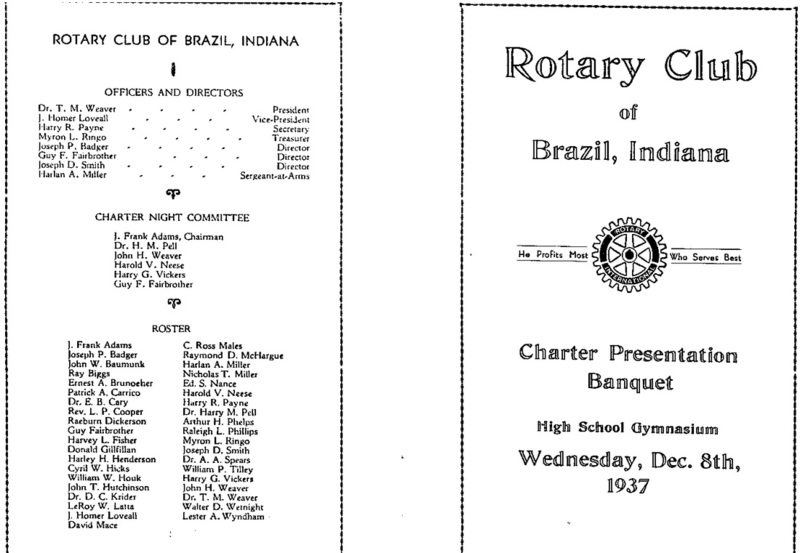 In February 1941, the local Rotary Club was host to Rotary International President Armando De Arruda Periera of San Paulo, Brazil. The event was held in the Brazil high school gym and over 600 attended, from clubs all over the midwest. The first annual Independence Day Celebration was held in Forest Park on July 4, 1936, at that time operated by the Lions Club. 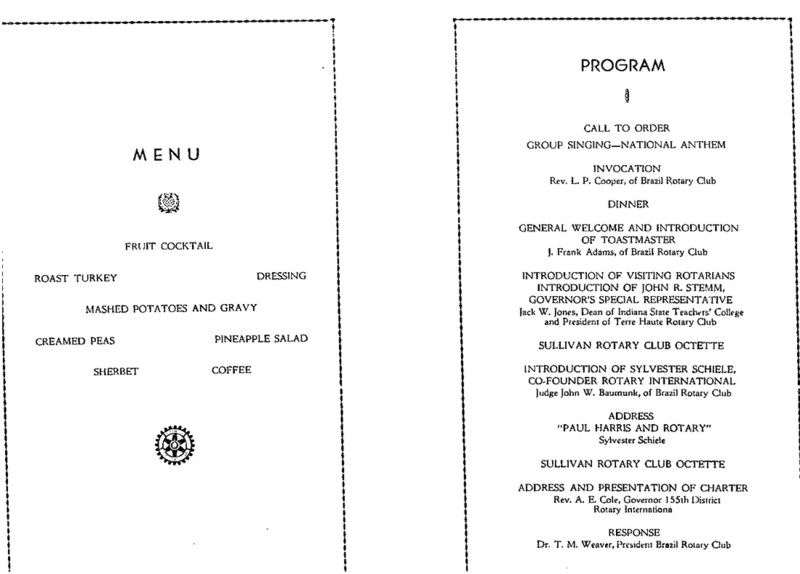 The Celebration has been held every year since by our Rotary Club, even during the World War II years. Many people plan their vacations around this time and look forward to coming back to Brazil to see friends and family. Our Club is known nation-wide for this event, one of the largest of its kind in the country, and we are envied by other Rotary Clubs. Proceeds from the 4th of July Celebration have gone to support such activities as: Forest Park, college scholarships, the Clay Co. YMCA, (We gave $80,000 for construction of the new YMCA which opened in 1998), high school bands, and numerous other local charities and activities. In 1945 the Brazil Rotary Club purchased a 40 acre tract of land at the intersection of South Harmony Road and County Road 900 North. The purpose of the purchase of the land was to use the land for a youth camp. A donation from the McCullough family aided the club in building a lodge, used for a meeting facility. This property was sold in 1991 and the Club voted to use the proceeds to donate to the construction of the new YMCA Building on Forest Avenue. The club has had various weekly meeting places. For years, Rotary met at the Blue Bonnet Restaurant, but its closing forced a move to Come and Get It Restaurant in Knightsville, on the far east side of Brazil. It also closed on Aug 31, 2003. For a while the Club met at the Elks Club in downtown Brazil, but recently the club returned to its original site, formerly Blue Bonnet...now under a new ownership and name, the Brazil Family Restaurant. Currently there are over 50 members, but we always have room for more! 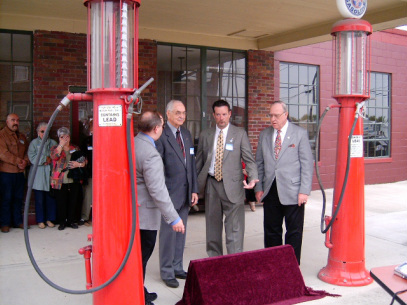 2005, the 100th anniversary of the founding of Rotary, the international vice president visited our club and presented a monument to Sylvester Schiele, a native of southern Clay County, and one of the three original founders of Rotary in Chicago in 1905. The monument was originally placed in downtown Clay City, IN. Pictured in center are Amos Thomas, a Brazil Rotarian since 1955 and Sam Glover, 2005 Brazil Rotary president. 2005 President Sam Glover (left) with Amos Thomas, placing a wreath on the actual a birthplace of Sylvester Shiele. The house is gone, but the land, just north of Clay City, is not a productive corn and soybean field.